2. Prior to kick off the two captains, in the presence of the referee, will toss a coin. The winning captain can choose to start with possession or chose ends, the other captain will then have the other of the alternatives. 3. All players must wear clothing that is considered safe. Anything considered unsafe or inappropriate by the referee must be removed at the referee’s request. 4. The object of the game is for the attack (the team in possession) to score tries. The winning team is the one who score the most tries. 5. A try is scored by grounding the ball in the opponents in goal area. 6. The game starts with a tap restart from the middle of the field by the team choosing to start the game with possession. A tap restart by the conceding team will occur after a try has been scored. 7. A tap is performed by placing the ball on the ground, leaving the ball on the ground then touching the foot against it and then picking it up or passing it. 8. The defending team must be back 10m at all tap restarts. 9. A legal touch is on any part of the body, clothing or ball. A player must claim a touch by raising a hand and shouting “Touch”. An attacker can initiate a touch by making contact with a defender. 10. After being touched, the player touched must perform a roll ball on the mark where they were touched. 11. The dummy half cannot score or be touched before passing the ball. If the dummy half is touched then a roll ball turnover occurs. If the dummy half scores, a roll ball turnover is awarded 5m from the goal line. 12. The attacking team continues play until they have had 6 touches. 13. The Roll ball is performed by placing the ball on the floor and moving it through the legs. It is permissible for the ball to be rolled but it must travel directly backwards, through the legs and cannot travel more than 1 metre. 14. If touched within 5m of the goal line then the attacker may, if they wish, take the roll ball back to a point 5m from the goal line. 14. All defending team members must retreat 5m from the roll ball. If the prescribed distance would result in the defenders standing behind the goal line then they only have to retreat to the goal line. 15. Defending players can only move forwards once the ball has touched the ground. 16. A roll ball turnover occurs when possession changes from one team to the other and play is restarted with a roll ball. 17. If a defender makes contact with the ball whilst making a deliberate attempt to play at the ball, but does not retain it, then the referee will play on and allow the attackers a new set of six touches, provided the ball has not made contact with the ground. 20. The defending team must be back 10m at all penalty restarts. If the prescribed distance would result in the defenders standing behind the goal line then they only have to retreat to the goal line. 21. The referee, at their discretion, may exclude players from the field of play. This can be temporary for a period of five minutes or permanently for the remainder of the match. i. If a touch is considered to be aggressive. ii. If the ball is passed in a forward direction. vii. If the attack obstruct a potential touch from the defending side. x. If a defender claims a touch when no touch has been made. This includes a player claiming a touch but then immediately correcting themselves. 23. A penalty is awarded on the mark of the offence. In the case of an offside player touching an opponent the penalty is always from where the touch was made. 24. Teams may interchange players at any time. Players coming on to the field may not do so until the player being replaced has come off. Substitutions must occur at or within the team’s substitution box. 25. The field is 70m long (scoreline to scoreline) and 50m wide. 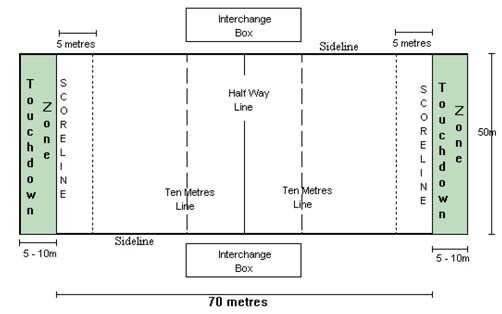 Substitution boxes measuring 20m in length shall be situated on both sides of the field at halfway. The Touchdown zone is the area beyond the scoreline.